1. Start Rhino, using the Large Objects – Feet template. 2. 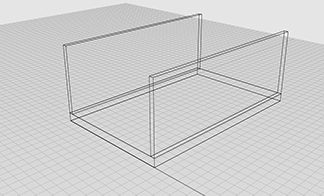 Double-click on the Perspective viewport label to maximize the viewport. 4. Type LAYER to bring up the Layers palette. Double-click on Layer 01 to rename it Floor. Click in the check-mark column to make the Floor layer current. 5. Type BOX. For the First corner of base, type 0,0 (zero comma zero) [enter]. 6. For the Other corner of base, type @14’,22’ (at fourteen feet comma twenty-two feet) [enter]. 7. For Height, type 1’ (one foot) [enter]. 8. In the Layers palette, double-click on Layer 02 to rename it Walls. Click in the check-mark column to make the Walls layer current. 10. For the Other corner of base, type @-6”,22’ (at negative six inches comma twenty-two feet) [enter]. 11. For Height, type 8’ (eight feet) [enter]. 12. Type COPY. Select the wall you just built. 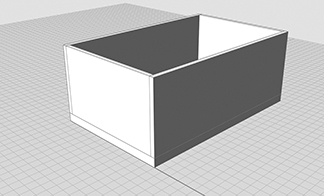 For Point to copy from, choose the inside corner of the base of the wall you just built. For Point to copy to, choose the outside corner of the opposite side of the floor. 14. Type ROTATE. Select the original wall. Rhino will prompt you to select one of two walls in the same place; choose either one. 15. For the Center of rotation, click on the outside corner of the base of the wall. 16. For the Angle or first reference point, type 90. 19. Use the COPY command to copy the new wall to the opposite side of the floor. 20. Type BOOLEANUNION. Select the four walls you just built and press [enter]. 21. Type SETDISPLAYMODE. Set the display mode to Rendered. 23. Type BOX. For the First corner of base, click on an inside edge of the short wall already built. (This point will correspond to the corner of the front door.) For Other corner of base, type @3’,-6” (at three feet comma negative six inches). For Height, type 6’8” (six feet eight inches). 24. Type BOOLEANDIFFERENCE. Select the walls [enter], then the door [enter]. 25. In the Layers palette, double-click on Layer 03 to rename it Roof. Click in the check-mark column to make the Walls layer current. 26. Type BOX. For the First corner of base, click on the near outside corner of the top of the walls. For the Other corner, click on the far outside corner of the walls. For the Height, type 6’ (six feet). 29. 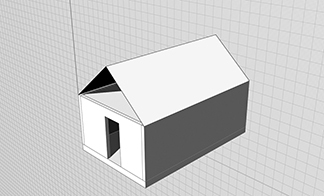 Type POLYLINE and draw a triangle on the front face of the “roof box” corresponding to the roof gable. Make sure to “close” the polyline by clicking on the first point to complete the triangle (a total of four clicks). 30. Click on the “roof box” and press [delete]. 31. Type EXTRUDECRV. Select the triangle you just drew. 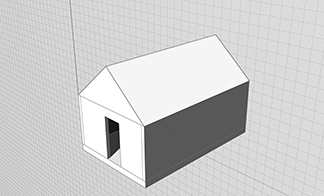 Click on the back of the house to “extrude” the triangle into a gable. 32. Type CAP. Select the extruded triangle. 33. Type CPLANE. Invoke the World option [w] and the Top plane [t]. RHINO is 3D modeling software produced by McNeel. It is widely used in design disciplines and is distinguished by its ability to handle complex curves and curved surfaces based on the NURBS mechanism. www.rhino3d.com for information, links, examples, and other resources. 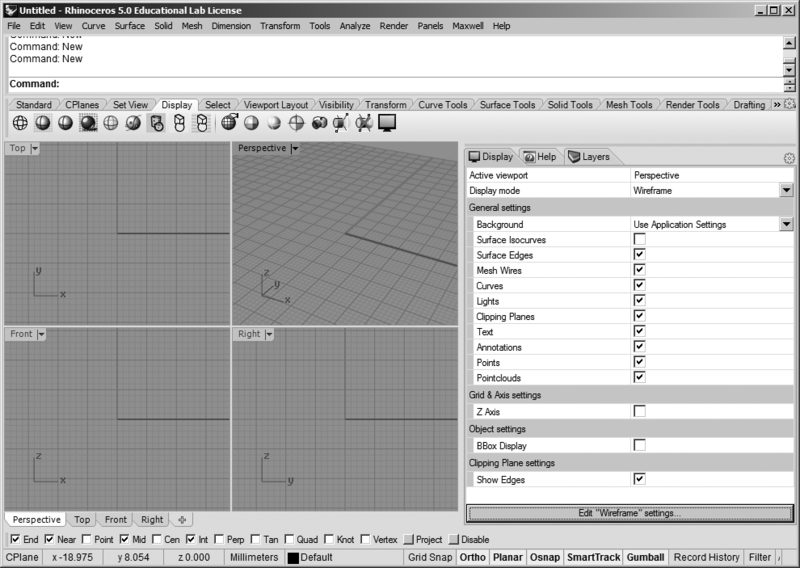 v5.rhino3d.com for a discussion forum. www.food4rhino.com for third-party plugins to extend Rhino’s functionality. 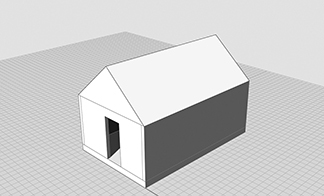 This step-by-step tutorial is a brief introduction to basic modeling tools in Rhino. 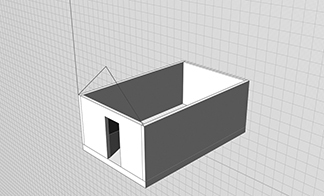 It leads to the creation of a simplified model of a shipping container (shown below). 1.1 Start Rhino and begin a New File. File > New. Select the Small Objects — Inches template and click Open. Note: The template affects how Rhino interprets the numbers and dimensions you enter. This template assumes that numbers represent inches, unless accompanied by a foot symbol (e. g., 3 = 3 inches; 3’ = 3 feet; 3’3 = 3 feet 3 inches). Drawing units can be changed later using the DocumentProperties command. Type LAYER at the Command prompt. This opens the Layers panel. Using this panel, click the New Layer button to create layers named GRID, WALLS, FLOOR, ROOF, and DOOR. Set each layer to a unique color. Note: These layers will store the objects you build. Layer names and colors are arbitrary. In particular, colors should not be expected to bear any relationship to the material being represented. It is conventional to choose distinct colors to make it easy to visually discern objects in different layers. 1.3 Set the GRID layer as the current layer. In the Layers palette, click the radio button next to the GRID layer. Note: The current layer will receive any newly created objects. 1.4 Turn on the ORTHO function. Click the [F8] key repeatedly until you see the note “Ortho is on” at the Command prompt. Note: The ORTHO function is an on-off switch, constraining many of the drawing and editing tools to moving along the X-Y axes. 1.5 Turn off the base grid. Type GRID at the Command prompt. Then type H (for “ShowGrid”. Press [Enter] to return to the Command prompt. 1.6 Set the object snaps. In the Object Snaps bar (bottom of the Rhino screen), make sure that the snaps for Intersection, Endpoint, and Midpoint are checked. Note: Object snaps are user-determined. 1.7 Maximize the Perspective viewport. Double-click on the word “Perspective” at the top left corner of the Perspective viewport. 1.8 Draw a base rectangle. Type RECTANGLE at the Command prompt. When prompted, enter 0,0 as the start point. For the second point, enter 38’4,7’5. Note: This base rectangle does not represent a built component. Instead, it measures the distance between alignment holes in the shipping container. Type Z at the Command prompt, then type E. At this point, the model should look like the diagram below. Note: This keyboard command quickly zooms to show the entire model. In the Layers palette, click the radio button next to the FLOOR layer. Note: The current layer will receive any newly created objects. Spin the center wheel on the mouse, or type Z at the Command prompt and drag the mouse to define a zoom window. Note: Zooming in gives you the ability to work with greater precision. 2.3 Begin to build a box at the intersection of the gridlines. Type BOX. Hover the mouse over the corner of the rectangle until the Intersection indicator appears. Click the mouse button. Note: The BOX command builds solid rectangular boxes. To complete the base of the box, type @7,-6.5. For the height, type 4.5. At this point, the model should look like the diagram below (zoomed-in view): Note: The @ symbol tells Rhino to use “relative coordinates” for the base of the box. 2.5 Move the box into the correct position. Type MOVE at the Command prompt. Select the box by clicking on its edge. Click [Enter] to complete the selection process. When prompted for a Point to move from, click anywhere in the drawing window. When prompted for a Point to move to, type @-2.5,3. Click [Enter]. Note: This step shows that it is sometimes much easier to construct Rhino objects in a temporary, incorrect position, and then to move the objects into their permanent, correct position. Type Z at the Command prompt, then type E. Note: This causes Rhino to display the entire model. 2.7 Mirror the box to the opposite side of the rectangle. Type MIRROR at the Command prompt. Click on the box to select it. Press [Enter] to complete the selection process. When prompted to select the Start of mirror plane, hover the mouse near the midpoint of one of the sides of the base rectangle. Click on a midpoint of the side. When prompted to set the End of mirror plane, move the mouse and Rhino will preview the mirrored location of the corner box. Click to complete the command. Note: The MIRROR command reflects objects through a line. 2.8 Mirror two boxes to the opposite side of the rectangle. Repeat the previous command, but select both corner boxes this time, and mirror them around the other axis (see diagram below). 4.1 Set the Display Mode to Shaded. Choose View > Shaded. Note: The Display Mode controls how Rhino displays objects. In the Layers palette, click the radio button next to the WALLS layer. Note: The current layer will receive any newly created objects. Type POLYLINE. 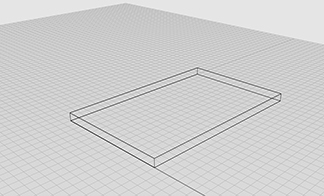 Click on the lower left-hand corner of the floor to begin drawing an outline of the corner post. Refer to the diagram below for dimensions. Starting at the lower left-hand corner, continue clockwise around the outline. For each new point, type the numbers as written. Note: The POLYLINE command creates a “polyline” (a single object consisting of multiple straight or curved segments). 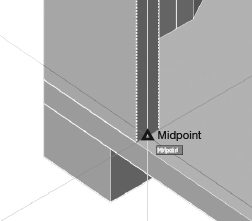 In Rhino (as distinct from AutoCAD), a POLYLINE need not be on a single plane. A closed polyline can be used as the base for a solid extrusion, as shown in the next step. Type EXTRUDECRV. Click on the outline of the corner post (the “curve”) to select it. Click [Enter] to complete the selection process. For the height, type 7’7” (seven feet, seven inches). Type CAP. Select the extrusion that you just created. Press [Enter] to complete the selection process. Note: The CAP command converts the extruded curve from an open to a closed polysurface. 5.1 Set a plan view and set its Display Mode to Shaded. Click on the Top tab (bottom of the drawing window). Choose View > Shaded. Type POLYLINE. Click on a point away from the shipping container to begin drawing an outline of the wall panel (we will move the panel into position later). Refer to the diagram below for dimensions. For the first segment, begin at the left, type @1.5<0. For the second segment, type @3<330. For the third and final segment, move the mouse to the right, and type @1.5<0. Press [Enter] to complete the polyline. Note: Again, in this step, we are creating an object in a temporary, incorrect position, so that we can move it into its permanent, correct position later. Type OFFSET. Then type D (for Distance). Type 1/16 to set the offset distance. Next, click on the polyline you just drew, and then click once above it. Repeat the OFFSET command, but this time click below the line. Note: The OFFSET command creates a copy of the original object, “offset” by a specified distance. 5.4 Erase the original polyline. Click on the original polyline to select it and press [Delete]. Type LINE. Draw a line at each end of the panel outline to “cap” it. Refer to the diagram below. 5.6 Combine the segments into a single polyline. Type CONNECT. Type J (for Join) to set the Join option to Yes. Click on one of the polyline segments, then click on one of the cap segments. Press [Enter] to repeat the command, then click on the same cap segment, and then on the next polyline segment. Press [Enter] again, click on the polyline segment, and finally [Enter] again, and click on the final cap segment. Note: The CONNECT command has the ability to join previously unconnected segments into a single polyline. However, the unconnected segments must have aligned endpoints. 5.7 Return to 3D modeling space. 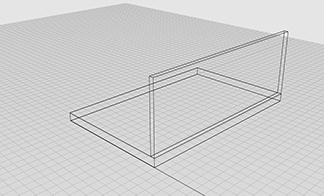 Click on the Perspective tab (bottom of the drawing window). 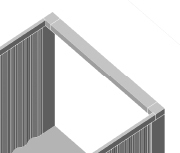 5.9 Extrude the outline vertically to create the wall panel. Type EXTRUDECRV. Click on the outline of the wall panel to select it. Click [Enter] to complete the selection process. For the height, type 7’7” (seven feet, seven inches). 5.10 Move the wall panel into position. 5.11 Erase the original polyline representing the base of the wall panel. Click on the original polyline and press [Delete]. Type ARRAY. Select the two wall panels and press [Enter]. For the Number in X direction, type 40. For the Number in Y direction, type 1. For the Number in Z direction, type 1. For the X spacing or first reference point, click on point A in the diagram above. For the Second reference point, click on point B. Press [Enter] to accept the result and complete the command. Note: The ARRAY command is used to make multiple copies of a single object, according to defined rules. Type COPY. Select the corner blocks (from the FLOOR layer). Copy them vertically so that they are set on top of the corner posts. Press [Esc] to complete the command. Type CHANGELAYER. Select the two corner blocks you just copied. Assign these objects to the WALLS layer. 6.5 Build a rail along the top of the wall. Type BOX. Begin the box by clicking on the corner point marked C in the upper diagram below. For the second point, zoom in on the other end of the wall, and click on the point marked D in the lower diagram below. For the height, type 4.5. In the Layers palette, turn off all layers except the WALLS layer. Note: Isolating a layer sometimes makes it easier to work. Type MIRROR. Draw a window around all of the objects in the WALLS layer. Press [Enter] to complete the selection. For the Start of mirror plane, click a point on the end of the temporary line you just drew. For the End of mirror plane, move the mouse and Rhino will preview the mirrored location of the objects. Click to complete the command. Click on the temporary mirror line and press [Delete]. Press and drag the right mouse button to rotate the view. Type MOVE. 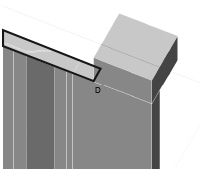 Select the rear wall and set it in place, so that its outer face aligns with the midpoint of the corner post as shown in the figure below. 8.6 Build a rail along the top of the rear wall. In the Layers palette, click the radio button next to the ROOF layer. Note: The current layer will receive any newly created objects. Type POLYLINE. Trace the outline of the roof opening between the top rails on all four walls. Type EXTRUDECRV. Select the outline you just drew and use -1 (negative 1) as the height. Type CAP. Select the extrusion you just created. Press [Enter] to complete the command. In the Layers palette, click the radio button next to the DOOR layer. Note: The current layer will receive any newly created objects. Type MOVE. 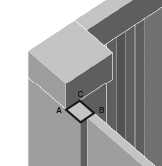 Select the door and set it in place, so that its inner face aligns with the point marked A in the figure below. Type MIRROR. 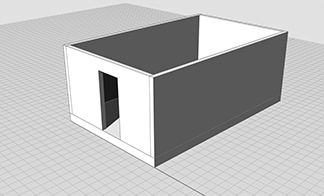 Select the door and mirror it around the midpoint of the shipping container floor. This completes the model. Rhino models can be “projected” into 2D line drawings for use in presentations or construction documentation. 1. Open a Rhino model. 2. Set the view you wish to project (e. g., a perspective view or an orthogonal projection like a plan or elevation). 5. Select the objects you wish to project. Press [Enter] when done. 8. Although you may or may not see the result of the MAKE2D command on your screen, Rhino has created new objects representing a 2D vector projection of the objects you selected above. Before doing anything else, immediately choose File > Export Selected. 9. Select the .dwg file format and save the drawing. 11. The resulting .dwg file can be opened in AutoCAD and checked for scale, layers, etc. It can be dimensioned and saved in AutoCAD and/or opened in Illustrator for further editing and annotation. This method begins with a set of pre-drawn AutoCAD plans, although the plans could also be drawn directly in Rhino using 2D drawing commands. 3. Create another new layer for new walls. 4. Make sure OSNAP is turned on (toolbar at the bottom of the screen). Check END to lock to endpoints. 6. Invoke the EXTRUDECRV (“Extrude Curve”) command to extrude the walls to their proper height. 7. 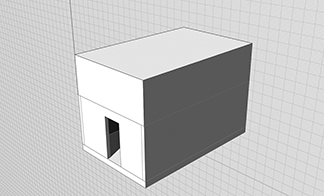 Invoke the CAP command to close the top and bottom of the extruded walls. 8. Use the BOOLEANDIFFERENCE command to “subtract” openings from the walls. 5. 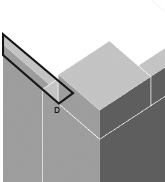 Use the BOX command to construct boxes of correct height and size on the AutoCAD drawings. 6. Use the BOOLEANUNION command to join separate walls together. 7. Use the BOOLEANDIFFERENCE command to “subtract” openings from the walls.